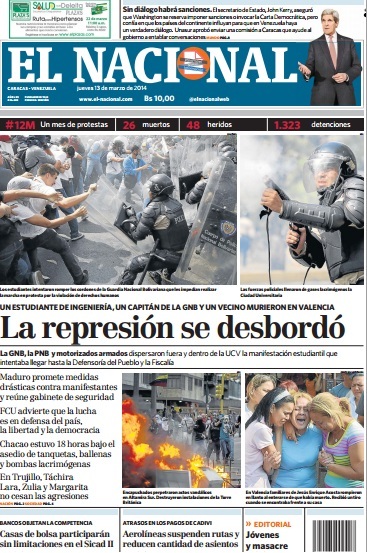 El Nacional’s front page today paints a dramatic picture of yesterday’s events, when three people were shot dead in Valencia, countless were injured, and a battle took place in Caracas’ Central University campus. There are reports that even the UCV Botanical Gardens suffered. This doesn’t lend itself to much analysis. Venezuela is quickly becoming a war zone, and the appropriate thing to do about battles is to narrate what happened – the time for assessment comes later. All I will say to people back home is: that is what wars do. Whether it is the lives of our fellow citizens or the integrity of prized landmarks, unless this conflict is somehow de-escalated, casualties will continue to mount. This is our new normal, and it may only get worse. For all the chaos that we now see, it’s possible we might look back upon these times as the good old days.